I’d planned on giving a review of the documentary Don’t You Forget About Me after watching it with Chooch this past weekend. It’s about John Hughes and his effect on film makers, actors and audiences over the last 20 plus years. If you’re a fan of his movies, I highly recommend you watch it, as I think you may be as surprised as I was just how many other folks feel still warm and fuzzy over his movies. Particularly his “teen movies” in which you got the feeling that he really got what high school was like. He was an adult and he hadn’t lost touch with what it was like being a teenager, and that is a rare thing, even today. The really surprising thing, was the number of teenagers in this 2009 film that felt the same way I did, but over 20 years later. In a strange twist of fate, I discovered a special return to the big screen of my own personal favorite of John Hughes’ catalog. 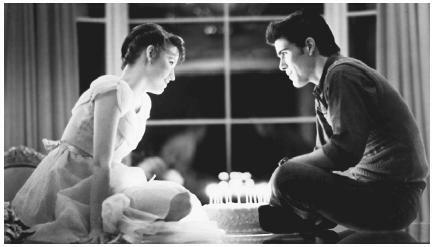 Twenty-seven years after its original release, Sixteen Candles will be shown on Sunday, February 13 and Monday, February 14 at 7pm in limited release at AMC theaters. No, really! Here’s the link to the press release! I’m ecstatic over this and hope that the shows sell out early. I can think of no better message to send to Hollywood as we are inundated with reboots of beloved movies. This classic cannot be improved upon, in my humble opinion, and I can’t wait to sit in a darkened theater with others just as excited as I am to see it again on the big screen. If you want to see it, I’m providing the AMC Theater link for you to search your location.